I am a total Windows novice, since I am running 2 Linux boxes with SuSE Linux 13.1. But since I bought recently a HP Pavilion 500-152ea which has both integrated graphics and a Radeon HD 8670D graphic board I downloaded the Lunatics Installer and it is running 4 setiathome_v7 7.00 units with an optimized app. But I cannot see any use of the GPU while Einstein@home is making use of it. My BOINC is 7.4.12 on a 64-bit Windows OS 8.1. Did I make some mistake in intalling? Message 1596447 - Posted: 3 Nov 2014, 14:47:12 UTC - in response to Message 1596446. I am a total Windows novice, since I am running 2 Linux boxes with SuSE Linux 3.1. But since I bought recently a HP Pavilion 500-152ea which has both integrated graphics and a Radeon HD 8670D graphic board I downloaded the Lunatics Installer and it is running 4 setiathme_v7 7.00 units with an optimized app. But I cannot see any use of the GPU while Einsten@home is making use of it. My BOINC is 7.4.2 on a 64-bit Windows OS 8.1. Did I make some mistake in intalling? 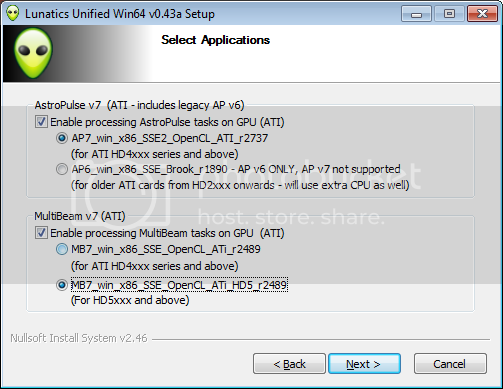 Did you check ATI processing in the installer ? but Mike will know better than I which of the two options in the lower part of the screen is more appropriate for the HD8670D. Just at the moment, you won't be able to get hold of any new tasks to run because the servers are playing up, but with any luck, that will be cleared up shortly, when the staff arrive in the Berkeley lab at the start of their working week. Message 1596452 - Posted: 3 Nov 2014, 15:02:05 UTC - in response to Message 1596451. Choose HD4 version for MB7 please. Thanks for your suggestions. I had forgotten to tick the boxes. I've received a report of a malware warning from Avast! antivirus on the 32-bit 0.43a setup program, and managed to reproduce it using the free version of Avast! I've submitted a false positive report, and they're looking into it - receipt acknowledged. Having allowed to receive new SETI@home tasks after installing Lunatics I got 13 of them on my 4-core AMD A10-6700 CPU. It looks like 9 of them are GPU tasks which use very little CPU (0.04). I am curious to see what happens, having already an ATLAS@home task (very heavy on memory) and two vLHC tasks, which went in suspension. Now I have 3 SETI CPU tasks and one SETI GPU task running. All on 8 GB RAM.Windows 8.1. CPU load is 63%, memory usage 61%, disk usage 22%, from Task Manager. First ATI GPU task completed and waiting for validation. Runtime is equal to those processed by CPU, 17k s on the Windows PC. CPU time much smaller (281 s). Message 1597353 - Posted: 5 Nov 2014, 21:06:12 UTC - in response to Message 1596949. Message 1589266) the 64-bit 0.43 setup program did not. Message 1597503 - Posted: 6 Nov 2014, 3:13:31 UTC - in response to Message 1597353. GPU tasks are processed one at the time and not in parallel even if one core is free. I am now running two vLHC@home tasks and one SETI@home GPU task on a 4-core CPU. Message 1597547 - Posted: 6 Nov 2014, 5:10:10 UTC - in response to Message 1597543. Message 1597587 - Posted: 6 Nov 2014, 9:25:19 UTC - in response to Message 1597547. I received 13 tasks, three for CPU and they completed while running also 2 at the same time if 2 cores were available with 2 vLHC@home tasks running. Now the GPU tasks run one by one even if another core is idle. Message 1597591 - Posted: 6 Nov 2014, 9:37:29 UTC - in response to Message 1597587. Do you use app_config.xml for any project and what are its/their contents? Message 1597592 - Posted: 6 Nov 2014, 9:43:54 UTC - in response to Message 1596452. Is there any performance difference between the two versions? I have two 5970's that fly with AP wu's but are slow is h*ll with HD5? Could it be that the pre HD5 version is much faster on ATI's? Message 1597593 - Posted: 6 Nov 2014, 9:47:39 UTC - in response to Message 1597591. I have used the Lunatics installer latest version. It's the first time I use Windows, but since it was 64-bit 8.1 I installed Virtual Box and started both ATLAS@home and vLHC@home, which don't use a GPU. Since the PC has one AMD.ATI board (HD 8670D) I have tried both Einstein@home and SETI@home to test its capabilities. I've downloaded 4 Einstein@home tasks, three CPU and one GPU. Two CPUs are running together with 2 vLHC@home tasks but the GPU task, when started, has put the SETI GPU task in waiting. Evidently there is a contention for the use of the GPU board. I am doing all this as an experiment, since my priorities on this PC are ATLAS first and vLHC second. The rest is optional. Message 1597631 - Posted: 6 Nov 2014, 10:55:53 UTC - in response to Message 1597614. Yes, the general default settings for both SETI and Einstein are to run one task per GPU board. If you changed both settings - here and at Einstein - to run two tasks per board (or each task to use only half a board, if you prefer), you could run a task of each type at the same time - though the effect that each has on the other's run time may not be what you expect. Otherwise, roughly speaking, the two projects will alternate in being given access to the board. Message 1597680 - Posted: 6 Nov 2014, 14:06:17 UTC - in response to Message 1597592. For Tullio's AMD A10-6700 APU system I definitely concur with Mike's advice. I have a laptop with A10-4600M APU which also has "Devastator" embedded GPU and the HD5 version of the MB7 app is definitely faster.